I have the tendency to not train too well for races. 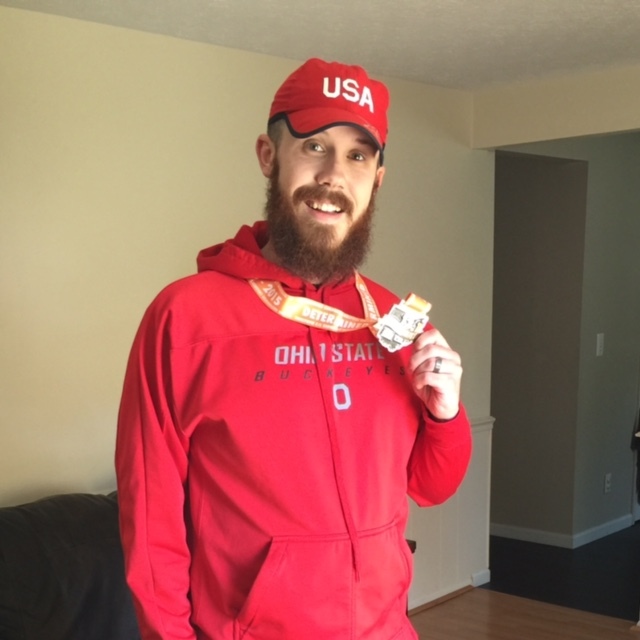 2013's Akron Marathon was the pinnacle of my lack of attention to training detail. Jokes are made about the "Thomas Costello Training Plan": paying money to sign up for a race, and then hoping for the best. Akron was the first major example of trying this plan, and I would repeat this training plan for the Canton HOF Half in 2014 and both the 2015 and 2016 Columbus Half marathons. Something about 2017 was different. There was a renewed sense of a mission, and a $26 marathon (if you aren't in the running community, this is CHEAP)! That mission was clean water and hygiene resources, through Lifewater International. I had run for Active:Water/Lifewater a few times prior to 2017, and the last time fund-raising was attempted was the 2016 Ohio 70.3 Half Ironman; where I had my first ever DNT, DNS, DNF (did not train, start, or finish). You can go through the back issues of my blog to read more about the history, but I started running because of Active:Water's mission. Honestly, I felt like I was letting down a calling to not share the message and save lives. So, with all this history bottled up inside of me, I started my training. Like the Minnesota Pee-Wee D-5 hockey team, I was rough around the edges. Humor was used as a coping mechanism, my skill was nowhere near the competition, and I was fighting off some regrets from the past. To make a long story short: training went much better than I could have expected. I actually trained! Running actual miles! My distance times rivaled where I was 5 years ago when I ran a somewhat successful Chicago marathon. The miles were being logged, and confidence was building. The fund-raising was going well too. My usual fund-raising plan is to inundate people with social media posts. This strategy stuck around in 2017, but other ideas crept into my head. 4+ years ago, with my work team, an idea struck me, but never came to pass: we could raise money for a cause and the bearded volunteers on the team would shave their facial hair into something funny (or completely off). Lack of interest squashed it back then, but the idea had a resurgence when a neighboring team in my new office held a "shave it or save it" contest with a bearded gentlemen on their team. It reminded me of what had once been, with a twist! Shave it or Save it would be a focal point of my fund-raising plan. Quick backstory, I stopped shaving in September of 2014, when my family and I moved back to NE Ohio from Richmond, VA. Second part to the backstory: my wife hated my beard/mustache because of the feel of it. I knew right away that there'd be a field general for the shave it side in Mrs. Costello. Bearded Training. Stretching is Important! During the span of training, other ideas would come to me while I was running. 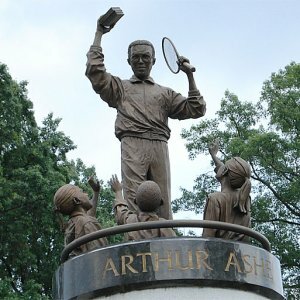 First, one day I thought it would be cool to connect my love of soccer with the mission of clean water. Maybe running to the home opener for Columbus Crew SC would get some attention? I first had to consult with my training plan to see if the miles would work. 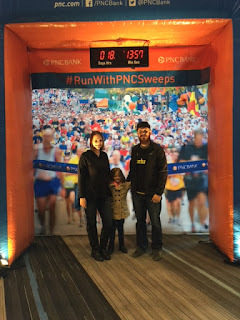 I lived 13 miles from the stadium, and the home opener was on the weekend of my 13 mile distance run!!! All of the graphic design prowess I could muster got me a graphic to share, but I'm paranoid and was afraid that even the likeness of the team's stadium would get me in trouble. Also, if I ran to the game in a Crew SC shirt, and dropped dead, would the team be liable (I work in insurance...)?!? I contacted the only front office contact that I had seen on Twitter about what I could and could not use in my advertising, with the first line of the email containing something along the lines of "I AM NOT ASKING FOR MONEY" (I didn't use caps in the original email, but it makes the blog post more exciting). You'd believe the shock I felt when not only were they fine with the idea, but they wanted to help me promote it!! A few short weeks later I'd be at the stadium, being interviewed by a staff member for their website (Click here to read the article). The run went great and there was around $400 donated in the days leading to, and the day of, the run to the fre. Second, retweets and shares for donations. I put out to everyone that if they shared a Facebook post I wrote, or retweeted a tweet, $1 would be donated to Lifewater International. This year was the first year that the fun was back in fund-raising. Ideas pop into my head but I wasn't always acting on it. Like I said, something about 2017 was different! My wife is a tactical genius. She hasn't admitted it yet, but I'm sure she had her army of beard haters waiting in the bunker until they saw the white hairs of my beard. One $120 donation came in. Minutes later (seriously), another $120. Then $15 here, $25 there, another $15, a 3rd $120 (NOT A COINCIDENCE AT ALL). Plus many more. The tides swung from a $100 "save it" lead to a $400+ "shave it" lead. When it was all said and done, at a pre-race dinner with our friends, family, and fellow runners, the beard was shaved off live on the Facebooks. I kept a groovy, 90's military style, mustache for the marathon. Technically, I never said the mustache was part of the shave it or save it. 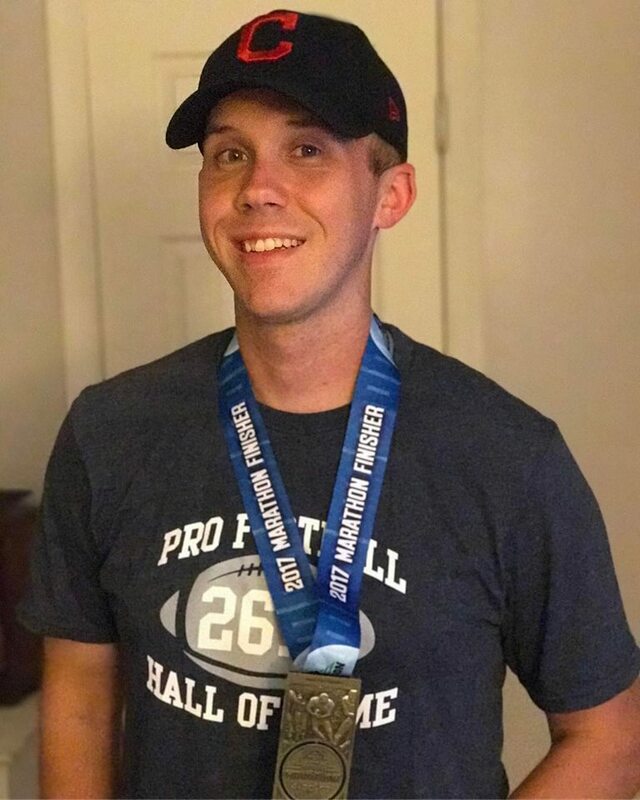 So training went great, fund-raising went better, and all that was left was the pee-wee finals against Coach Riley and the Hawks (aka finishing the marathon). For a week leading to race day, the weather forecast had chances of rain and a high of 88-ish. As days passed, the rain cleared off my weather.com app but the temperatures stayed the same. Race morning arrived and the 7 o'clock start was forecasted at 60 with a noon temp at 80+. With 15 minutes till the start, it was announced that the highway getting into the city was backed up, due to an accident, so they would delay the start an additional 15 minutes. Which, honestly, is not that big of a deal, but I was hoping to start as early as possible. One positive that day was that I wouldn't have to run the marathon alone. For the first chunk of the race (about a 7 mile chunk) I ran with Mr. Daren Wendell (aka family man, all around good guy, Lifewater all-star, and the guy who ran 100 marathons in 100 days from San Diego to New York City (no biggie)). Those first 7 miles, which I'll coin as the "sweaty 7", were fun. We made a lot of jokes about water stops hurting our Boston qualifying chances (and, you know, running 10:15 per mile), running up the monument stairs, $26 marathons, and our love of the Alan Jackson song 'Chattahoochee'. He was straightforward with me when it came to us running the race together: he was on the "Thomas Costello Training Plan" and he said I could go ahead whenever I wanted. Back to the "sweaty 7". I sweat so much for the first part of the race. More than any other part of the race. This was due to the sun coming out (ten days NE Ohioans get to see the sun and one happened to be on marathon day) and not having the means to hydrate as much as the conditions called for. I took multiple gatorades at each stop, sipped a little water (as to not wash out the salt from my body) and poured the rest in my hat. It wasn't enough. At mile 8, I stopped for... uhhh.. not sure how to say it so I'll guess I'll just say it: to poop. Think about temperatures climbing, all the sweat from the race, and thousands of people sharing the misery together; then get into a portapotty. 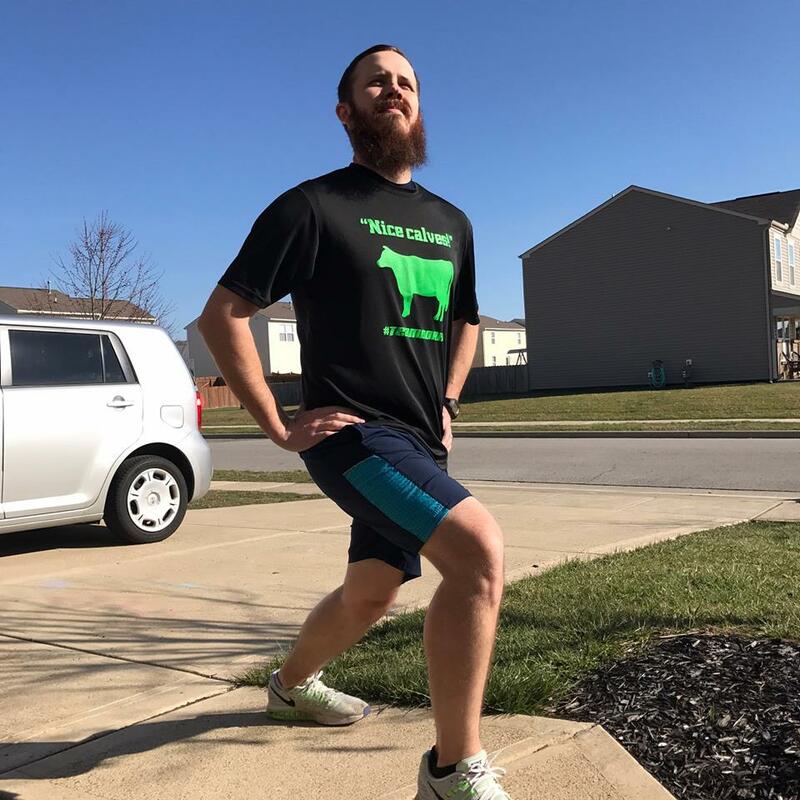 I'm not going to go into much more detail, except that I may have sweat as much in that portapotty than I did running..... Well, now that there's no one reading this blog post anymore, I'll finish the talk around the running of the race. My training up to race day had me completing 20 miles at a relatively fast (fast for me) clip. Going into Sunday, I was hoping to make it to 20 and then fight through the last 6. The fight started around mile 12. At races that have multiple distances, there's a spot where half marathoners break off from marathoners, and relay runners, to the finish line. It's AWFULLY enticing to finish your race 13 miles early, on a smoldering hot day (smoldering hot in terms of the Ohio, April, definition of smoldering. Add to that the fact that all the training was completed in the winter/early spring and conditioning wasn't fantastic for me), but I persisted. I didn't want to persist but I thought about the people who sent in donations. I thought about the people being helped through Lifewater international. I thought of my dead beard hairs in the church's dumpster. I had to finish the race for them. My plan at the turn around point of the race was a run/fast walk. I would run as far as I could and then walk as fast as I could till I felt good enough to keep going. Micro-focus was the name of the game: I can survive the next second. Then it turned into the next 5 seconds. Then I told myself, out loud, run to the next mile marker. Then, run to the next stop light. Then, run to the next water stop. When runners asked me what my time goal was (because thats what us runners do), I shared that I didn't really have one, and I wanted to finish. Real talk time, I wanted to finish in under 5 hours. I'm not a math wiz, but around mile 19 I hadn't seen a clock anywhere, and had no clue how close I was to the 6 hour cut off. Now I just wanted to finish before I got picked up (see above where I said I'm paranoid). Right before mile 21 I saw that I was at the 4 hour mark. That was a huge relief. At that point, I started to talk to other people who were in the struggle with me. I talked to a nice couple from Youngstown, some RWB team runners (Red, White, and Blue) who ran with flags, and met a runner who I had talked to before online (@andrewrunsalot). Andrew had completed the half marathon and THEN volunteered on mile 22ish! He had a plate of orange slices and watermelon. The fireman-stache was a dead giveaway that I was the guy who shaved his beard for the race. Meeting him, the others, and eating an orange slice, gave me a renewed sense of purpose. For the last 5 miles I shared about Lifewater international with about ten people (turns out the stache was a great icebreaker). One of those ten even asked me about it because of the Team Active:Water shirt. Winning! As I inched closer and closer to the finish, I saw Daren. He was about a mile behind me. I reached mile marker 26 and stopped. 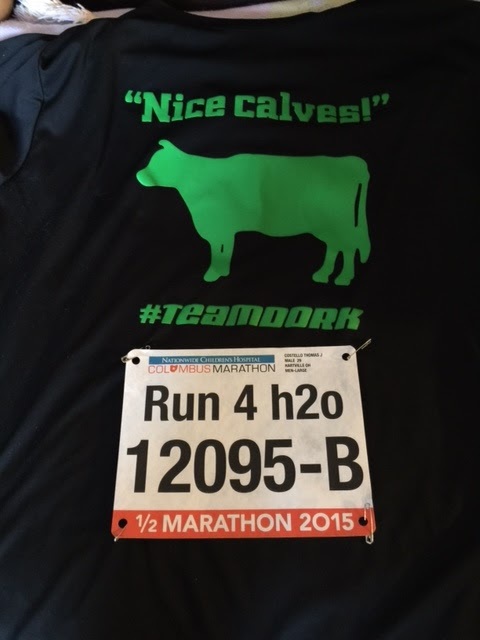 No PRs were being met and the time wasn't important: this marathon was a way to share the Lifewater mission. What better way to finish the race than with the person who God used to share the water crisis and the motivation to help stop it? While I waited for Daren, a woman asked me about my shirt and if I knew a guy named Daren Wendell. She went to high school with Daren, the youth pastor from our church in Canton, and the head pastor of our church in Pickerington. What're the chances?! Daren turned the corner to the 26th mile maker, and we Chattahoocheed our way across the finish line. I can't promise that I'll write much more in this blog, because, ya know, life. I'm going to keep signing up for races. Keep up with actual training for races. Most importantly, I'll keep using it as a platform to share the mission. Over the next year or so I'd like to go back to some ideas I've had in the past and plant the seed to see if it grows. This is a long blog post. If you read all of this, thank you! If I've missed some obvious opportunities to throw more Mighty Ducks references into this post, please let me know in the comments below. Jeez, where have you guys been for the last year and a half? Ok so maybe this blog isn't updated all that much. Maybe I haven't posted since June of 2014. Maybe I don't live in Virginia anymore. Maybe I have a new job. ANYWAY! I ran a race today! The Columbus half marathon, since I kinda moved to Columbus. 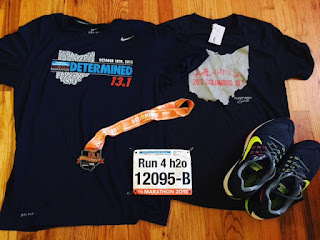 At the beginning of the year I signed up to run the Columbus marathon. It was going to be my comeback. Training, running, cycling, swimming, and healthy eating habits have kind of gone out the window in the past couple years. By the end of 2015 I was going to be back on track! Fast forward a few months and I hadn't trained, took up a new position, and moved to another city (kinda). I ended up paying to switch to the half marathon, which ended up equaling the amount it would have cost to sign up for the half because I signed up for the full so early. Surely I could find the time, and fight the excuses, to put in the necessary training! Yeaaaaaah about that. I didn't. I ran once every couple of weeks, with exception of the last couple of weeks when I went into race panic mode, and found additional motivation which will be shared at the end of this post (this is called "a tease"). When friends asked about the race I lowered my race expectations. I would joke (hard to believe) that I wouldn't be "running" the race, I'd be completing the race. I shared that my longest training run was 5 miles and I may not make it halfway through. I also shared my plan to run to each fluid station and then walk through. Expectations were lowered to the point that passing out would be the only way to not meet them, and my body has enough reserves to stop that from happening. Saturday my family and I drove down to Columbus for race weekend. We dropped the little one off at our sisters and the misses, oldest daughter, and I headed to the expo. I bought some half off Nike structure 18s, picked up my race packet, and visited some booths. 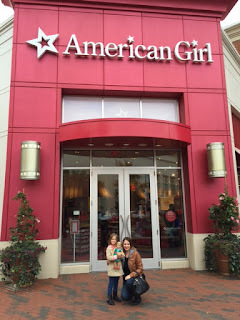 After our short stay we made our way to Easton town center to take my oldest out for her birthday. 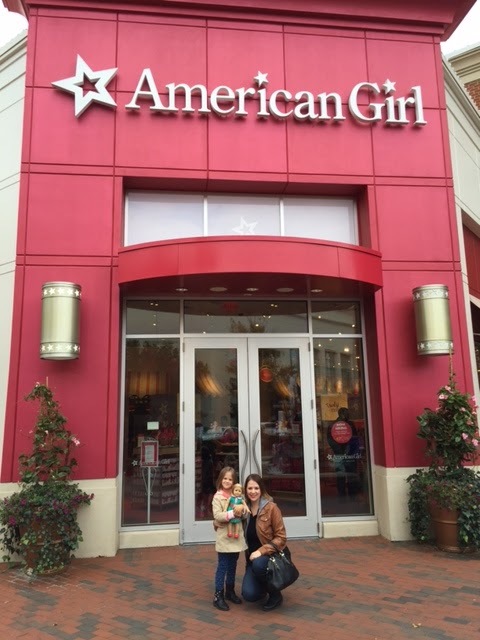 We ate at Red Robin (see healthy eating habits going out the window) and took her to the American Girl store. Good times had by all. More on the Team Dork stuff in a later post. Runners seem to enjoy the shirt. I ended up sleeping well, except for a span of ten minutes at 3 AM, and woke up ready to get the race over with. After a few minutes of beard grooming talk I felt much more relaxed about the day. About ten minutes before race start something cool happened. In a sea of thousands of people an old friend walked up to the same heater. 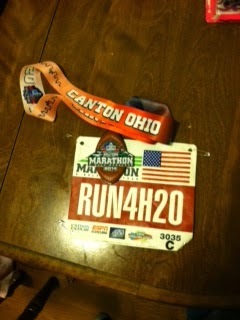 The same friend that I ran the Columbus half marathon with four years ago! I approached him and within about ten seconds he knew who I was (I didn't have a beard four years ago). After he finally recognized me he complimented my beard and we got to catching up. I'd been wanting to run Columbus again since 2011 but other races came up, or I moved out of state, so seeing him at the same race, four years apart, made the days events much more memorable. The starting gun fired and off I went. My pace plan was to slow down anytime I thought about pace. So far so good after the first few miles. At mile four I went through my second fluid station without walking. I felt alright so I threw that plan away. 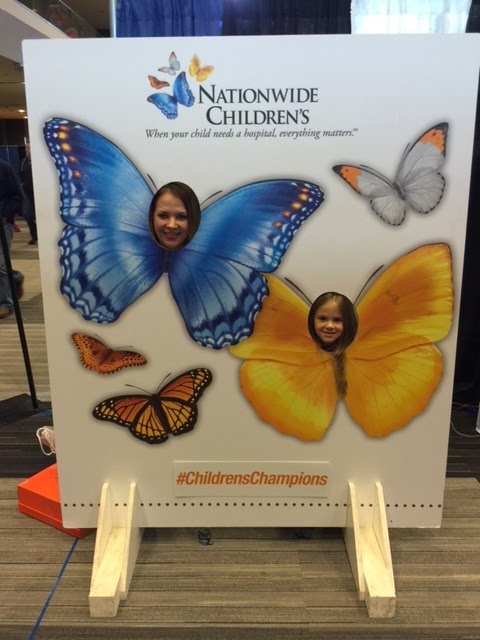 One item to note about Columbus' race is that every mile has a different patient from the nationwide children's hospital present. Kids that are mostly 6 and under with life altering diseases. This was extremely humbling, sobering, and motivating. At every tent featuring one of the kids I would get choked up. I thought about all they go through (and not touching on how hard it is for them) and the fact that my kids are healthy. Having a bad race is a joke of a problem compared to these kid's and their family's struggles. Race shirt to the left. The shirt to the right was a gift for purchasing shoes at half off retail price..
My intention is to get this blog going again. I like sharing different race and training experiences with you all (all three of you). I haven't had many races to share about but that's going to change. What races you ask? Just one. The Ironman 70.3 Ohio. I'll share more about next years goal and some other running related stories from the past year and a half in the coming weeks. Thanks for stopping by! Don't be a stranger. So it looks like I haven't posted for two months. Where does the time go!?!? The emails requesting I update this blog have not gone unnoticed! 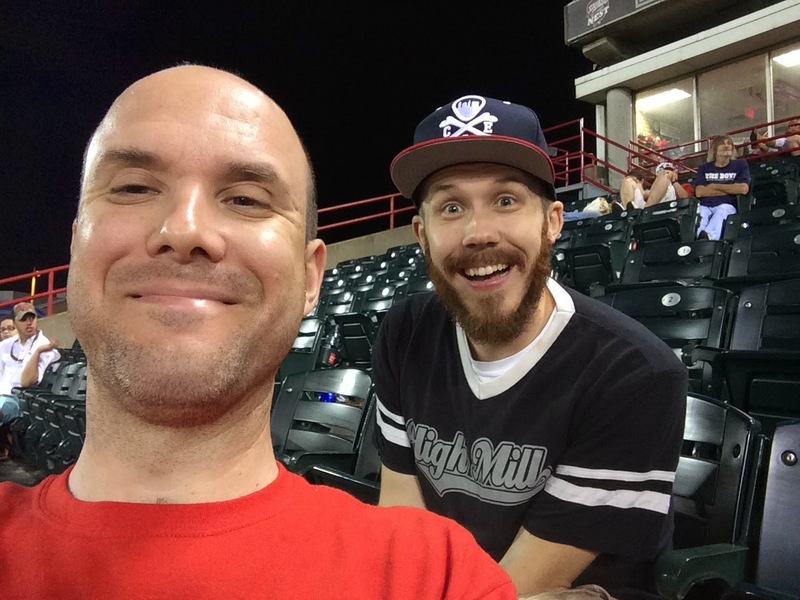 In those two months I've had a few weeks away from my family, volunteered as run course captain at a local triathlon, went to an AWESOME minor league baseball game (2 hour rain delay and then a 14 inning extra inning game of baseball madness! PLUS Mike got himself a foul ball. #freebaseball), was hired at the YMCA (second job), went to Delaware for some exciting work meetings, and there is always the normal everyday stuff that is probably not worth mentioning. There was also an important life milestone and a couple holidays. My wife and I celebrated our 6th wedding anniversary and, in that same week, there was National Running Day and National Donut Day. Talk about a mind explosion of awesome. To get a little more recent with the goings on of my exciting life, I've been sucked into the World Cup. I'm a fan of sport and I have been known to watch any soccer match that comes on the tele, but this World Cup has been so awesome that my level fandom has skyrocketed. The "I-took-a-day-off-work-to-watch-a-match" level. Finally, to get even MORE recent, I worked another triathlon this morning. The "I Love the Tavern Triathlon". I've manned the bike and run courses so this time I tackled the transition area. With working a new area there was a learning curve. If I had to grade how well I did I would go with a C+. With 400+ bikes (some with a price tag close to 10k) you have to be careful and only allow athletes into the transition. For the first 45 minutes I failed at this. During this time myself, and 6 other volunteers, were body marking everyone. 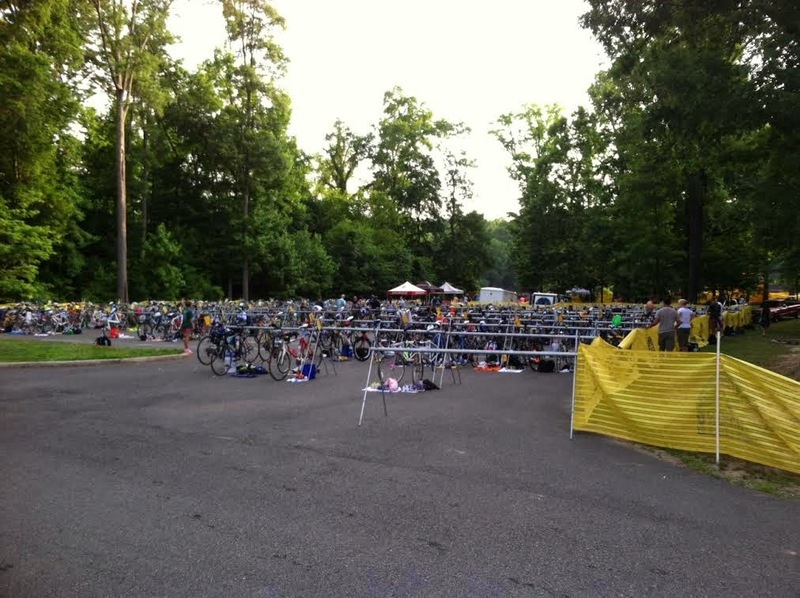 After the transition area got in lockdown mode, myself, and a few others, worked the mount line. It's critical that an athlete does not mount their bike until after they cross the line. It was during this time I was sure I would lose my voice. For a quick second I worried about having to go to work tomorrow without a voice. I realized how this irrational this is too. Once the bikes left the transition I got to talking to one of my fellow volunteers. He is leaving for college and was telling me about his triathlon exploits. Him and his family went around the country and he would compete in triathlons. You wouldn't know it just from meeting him. He was extremely humble with his exploits. Telling you this allows me to transition into someone I met who was the complete opposite.. The race took place alongside the James River, in a local park. Whilst playing transition bouncer a gentlemen walked up who was not marked as an athlete. I told him that only athletes were allowed in the transition area. In an accent that sounded Australian (which ended up being a southern accent with a wad of dip in his mouth) he told me he ran this park. Also telling me he could shut down the race if he wanted to. I looked at him a little perplexed (see southern accent with big wad of dip in his mouth) and he said "you don't believe me?". I replied "I do believe you". The question was apparently not going to sway his decision to show me his I.D. because he started getting it out while I answered said question. I'm not sure if he was waiting for an apology or something because he stood there for a few extra seconds, said something I could not understand, and walked away. Good times! The next time I transition captain I will do much better. Aside from the one part about letting in spectators, I needed to be told what to do a couple times. Chalk it up to lack of experience. Practice makes perfect, I guess. Speaking of transition. The last couple months have been the toughest of our time here. When we first moved here we were meeting people, and attempting to build friendships, but that has almost stopped. I say attempt lightly. Working out has also been put on the back burner. I've worked out once every couple weeks for the past month (which may be a contributing factor in us having that blah feeling). The support here has been great. The people we have spent time with are great. Finding a church has been a rough spot. At first we thought we found one, and went for a few months, but it was not for us. Since then we've been a few places a few times each and nothing seems to fit. It's to the point where they're starting to blend together. I don't know. We've just been tired. Tired and overwhelmed. Overwhelmed and disengaged from the world. We've put ourselves on a little pity island and used the row boat and oars as kindling for a fire. I'm going to do what's best for my family and go where God wants us, but I don't know where that is. Is it back to Ohio? Here in Virginia? Who knows. Maybe we just need some practice. What a week. What a weekend. The wife, wee tots, and I were in the great buckeye state since Easter weekend. 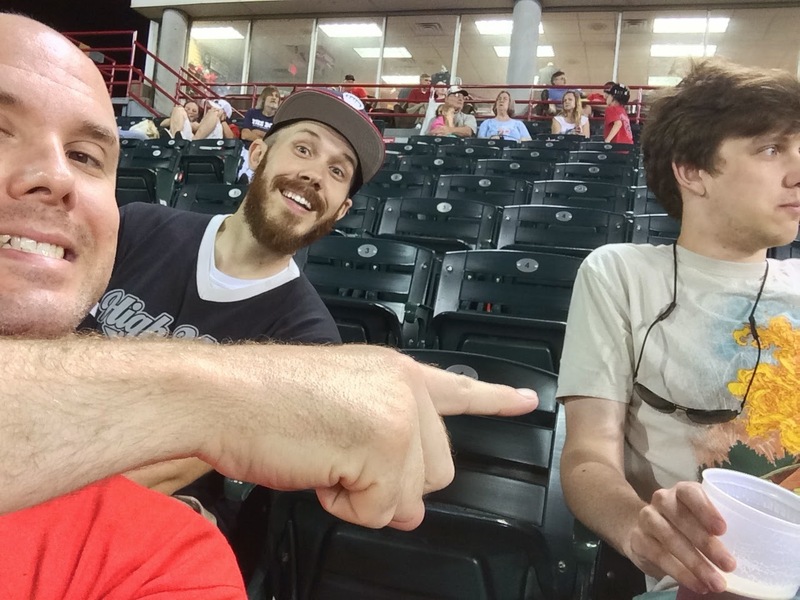 Stayed with family, met with friends, had a couple of good runs, ate a ton of local cuisine, and took my friend to his first baseball game. All of that will be talked about in a later post. 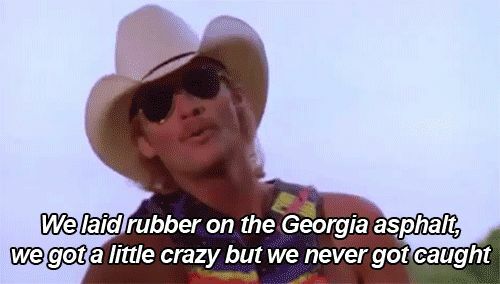 You're here for a race recap. One word to describe it: Epic. I didn't train too well for this one. A few weeks back I went out on that ten miler and felt competent enough to continue with the race, and I'm glad that I did. 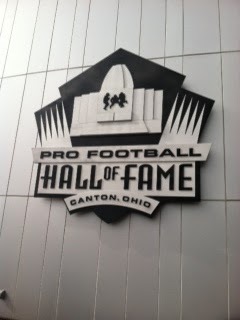 The race weekend started, for me, on Saturday at the football hall of fame. The expo wound it's way through the history filled halls. After picking up my expo bag I learned about the history of the game. Checked out a couple booths and walked through the hall with all the player bronze heads. After that I made my way to the Akron Marathon booth, shuttered, and continued to the history of the super bowl. I did my best to lay low on Saturday to rest up for the race. I have a history of doing a lot of stuff the day before a big race. Not too smart. The week had been rough, in terms of quality of sleep. I was sleeping in a bed I wasn't familiar with and there was an evil pomeranian (which doesn't need to be specified since they are all evil) who liked to bark at 5:30 in the morning. It had made me a little grumpy throughout the week, when I was in the same house with the yapping mutt. With that being said I made an effort to go to bed earlier on Saturday since I knew I'd be up at 4:15. I did my usual pre-race ritual of pinning on my bib and setting out all of my clothes. Included in the ritual was me packing since I would be driving home after the race. Sunday morning came and I woke up and got to the field much earlier than I had to. The temperature for race start was in the upper 30s with a light breeze. My running ensemble included shorts, a long sleeve under shirt, Active:Water jersey, throw away gloves, throw away shirt, and the normal shoes and socks. I wasn't too worried about the bare legs but many appeared to be. This choice of clothes is fine for running the race but waiting an hour and a half outdoors this is not the best idea. In an effort to conserve body heat, and fight off hypothermia, I ducked into a bathroom under the stadium stands. There were port a johns so I was worried they'd lock the running water bathrooms. Luckily for me they did not. When I entered there were already 3 other guys standing in there with the same idea. They were from Chicago and had just came in the day before. Felt good knowing that there were some out of state people venturing into Canton, Ohio for a race (even though I guess I fit that mold now). I reluctantly left my toilet clad paradise to find some friends from the High Mill running group. Moments after leaving the commode zone I spotted Duane Acito. We got to catch up for a while and after a good half hour we made our way to the start corrals. I put myself behind the 2:10 half marathon pacer. Going into the race I put myself at between 2:10 and 2:15 for a finishing time. Spirits were high in the corrals. I hit someone with my arm when I removed my throw away shirt and they were fun about it. Gotta love the runner community. A few minutes later I overheard them talking about how to get rid of their throw away clothes and I gave them my way. Throw it and then look in the opposite direction. That way if you hit someone they won't know it was you (unless they saw you throw it of course). I may or may not have done this in Chicago. In all fairness it's hard NOT to hit someone in the sea of people of Chicago. There were no speakers so I didn't hear anything about the countdown or national anthem. A few minutes before the gun went off (which we could hear) I saw another HM runner, Shane. He was running his first half and was nervous. He told me how unprepared he felt. His long run was a 13 mile treadmill session that made him feel like crap. Ran it at 10:00 a mile. After that the gun went off and away we went. I did my usual start slower than most strategy and it went well. Saw some people I knew in the group of racers and looked forward to mile 4ish when I would see my wife, kids, and mother in law. There was a good mix of up and down hills for first third of the race. On Market St., before seeing my wife, I saw a co-worker of mine, from Nationwide, named Kyle. It's always a pleasant surprise to see people you know on the race course. He was there for a family member. Soon after I approached my girls and made a slight mistake. I took off my throw away gloves and gave one to each of my daughters. It was definitely an aw moment. My mother in law handed me my Active:Water bracelet that fell off removing gloves, I kissed my wife, and I was off again. A few steps later my great friend Jermaine was there snapping a photo. I probably ruined his photo by running straight towards him and getting a high five. This brings us to mile 6. I saw Kyle again (he was biking the course) and then another friend Matt. I got myself another high five, he complimented my form, and then ran a few steps with me. Side note: Having people you know cheer you on during a race is a great feeling. I've invited people out, thinking that most people won't do it (from experience), but man did Sunday feel great. The lesson from this is that I should run more hometown races. The next few miles didn't have much to write about. I saw Kyle again. Miles 9 through 10 we were in the park below the Hall of Fame. I saw Kyle again. Right after mile 10 was when my legs started feeling heavy. I could feel the lack of training. It was at this point someone body checked me from behind, it was Shane. After he apologized for checking me we talked about how he was feeling and he had a big smile on his face. He said he felt great (rub it in) and I gave him a good luck shout before he kept going. He was killing it for sure. It was before mile 12 that I felt like I had run out of energy but I kept going. I struck up a conversation with someone to get my mind off of things but once he sped up I told him good luck and let him go on his merry way. The last half mile goes in front of the hall and around a practice field. Once we button hooked the field you could see it. The stadium entrance. I'm just going to come out and say it. Approaching the finish always chokes me up. I'm even getting choked up right now thinking about it. Luckily because of dehydration from all the running no one ever notices! WIN! I entered the stadium turned to the finish, gave Kyle a high five, and pushed it through the finish with my arms up in the air. Final time: 2:05:58. Did better than I thought. Not my PR but only a couple minutes off. After this race I really want to get back into endurance running. The race experience was that good. You couldn't tell this was their first year of putting on a race of this caliber. I will definitely be doing it next year. Probably going to do the half. It will be two weeks after I run 29 miles with Daren Wendell on the Run Daren Run cross country run. I highly recommend you look into the Pro Football Hall of Fame marathon and REALLY look into Run Daren Run. My goal now is to get an under 2 hour half and then train well for a full Marathon by years end. Either Richmond or Columbus. I've got the running itch and I'm going to scratch the crap out of it. Throughout the bike portion of the race I did my job of making sure volunteers were in their spots and no cyclists needed help. I gave all the volunteers my phone number and told them their duties: A. tell the runners where to go with a bright orange flag and B. Call me if anything happens. I stopped a couple of times for stopped cyclists but was waved off both times. One was for a woman with a broken clip and another just stopped to readjust. A couple hours after the race start there were two cyclists left but I noticed something a bit off. The police were leaving their posts. The volunteers then left too.. I called the coordinator and they quickly got the police back out for the two remaining riders. They were about a mile from the dismount. One of the two was the cyclist with the broken clip. She couldn't get up hills because her feet had no traction on the clips. I offered to help or take her and her bike back but she declined. This isn't surprising. Regardless of circumstances she was set on finishing. Arriving back at the YMCA I stood and watched the award ceremony, while waiting for the volunteer coordinator. During the ceremony the swim captain came up and said something along the lines of "I wonder if that cyclist who got hit by the car is ok." WHAT?!? An 80+ year old cyclist got hit by someone blowing through a light. The car clipped the back tire of the bike and he was fine, but due to his age was taken to the hospital for observation. The same intersection had three teenage girls with my phone number (that doesn't sound creepy at all). Not once did they contact me. There were police there to apprehend the idiot driver though. Score one for the good guys. Regardless of someone getting struck on the course I was told I did a great job. I didn't believe it but she followed it up saying she wanted me to captain again and said she wouldn't tell someone they did a good job if they didn't. Signed up for the May 18th tri as bike captain again. The Chasing Chicken triathlon had a the racers actually chasing a chicken..
Now 600. It has nothing to do with bike captaining a race. It's a countdown. When I got back from the race my wife went and laid down because she wasn't feeling good. This continued to Monday and I had to stay home from work. A nasty stomach bug worked its way into our home. I was bored Monday so I did random searches online. I've mentioned this in the last couple years but I had this crazy plan to complete an Ironman by the time I was 30. I made this "bucket list" type goal before I was even running. Wouldn't you guess it but searching for November 29, 2015 told me I had 600 days till my 30th birthday! Imagine the motivation and excitement that flowed through my veins? Today is 595 days and I'm getting focused. That 140.6 will be completed. I've got a long way to go but I'm going to start equipping myself, physically. By that I mean getting better at swimming. Still feeling like rubbish about my abilities. I would sign up for one today if I had confidence in it but that'll come with practice and time. On the social front, my family actually left our house last night to talk to other human beings! GASP! We made our way out to the mighty James river for an open water Richmond Triathlon Club "swim and social". I was a spectator of the swimming and phew was the current going. A good 7 to 10 people were swimming in place. Call it an aquamill (don't call it that). One of the Thursday trail running Dad's, Joe, came with his wife and kids. While he was killing it on the swim we played frisbee, cleaned up boo boos, and I opened beer bottles for people without bottle openers (using the side of a picnic table). After my sober foot was drenched with Sam Adams I had some good tri talk. Heart rates, race plans, and much more. It's downright therapeutic talking about endurance sports. Aimee tuned this conversation out faster than I tune out camera specs. In other news, I had my YMCA interview on Thursday. Going for a part time member services position. I felt like I did extremely well except one minor mistake... I'll elaborate on that in my next post. Today I'm going to get some miles in on my Nikes. Maybe 6 to 8. 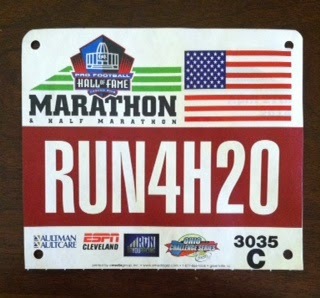 HOF 13.1 in two weeks in Canton! I'm just excited to share about today's run. It wasn't my fastest or longest but it brought back that feeling I haven't had in a while. I felt like a runner again. Started Thursday with a 4 mile trail run. It was the first time I've gone into a trail run voluntarily. The last time, which I swore would be the last, was at my first 5k when half of it ended up being through the woods. Thursday I met up with some local folk who I met on Facebook. I'm used to running with other people and for the past few months I've been going at it solo. Actually, every run in the entire month of March I completed on the treadmill. The guys I ran with were there for their kid's tri practice. That's right. Kids tri practice. There must have been at least 30 kids between the ages of 6 to 12ish taking part in strength drills. I think 30 is the amount of triathletes in all of Canton. We bobbed and weaved through a local park and our first two mile lap was around 9:30 a mile. I wanted to quit at that point. Many times I held back the "you guys go ahead!" 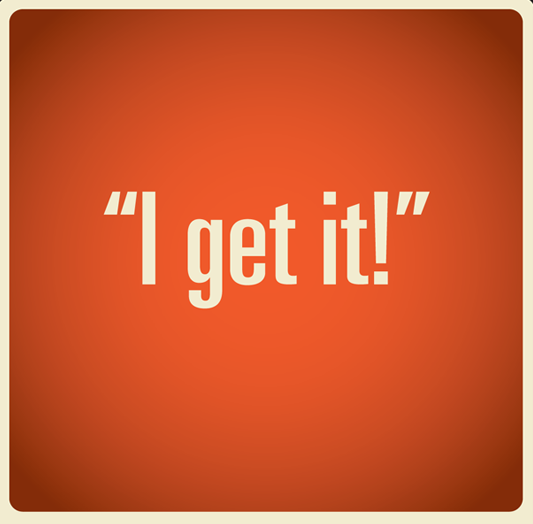 comment I'm so used to saying. The last tenth of a mile I fell back but I was able to hold my own. I'll be going back at it next week. Today's ten mile run was pre-planned a few days back. I created the route to be on the bike course for tomorrow's Chasing Chicken Reverse Tri, the one I will be volunteering as bike captain. My plan for the run was to check out the road and make sure there wasn't any debris or issues. I woke up this morning (and once during the night thanks to my youngest wanting chocolate milk (which she did not get)) not feeling the best. It's funny how when important things are planned things seem to get in the way. I was also a good deal sore from Thursday's run (it's always two days after the work out when it hits you). 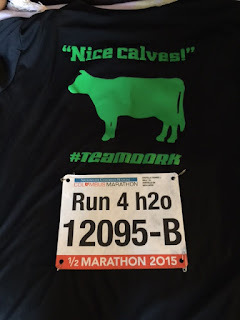 The illness subsided so I got my running clothes ready, which were half unclean. I wasn't going to let anything else stop me from going out the door. Once I put on my stinky clothes I couldn't find my water bottle sleeve or sunscreen. I still wasn't going to let it stop me. I put the bottle in my hand and took my pale skin out for a run. 1.4 miles in I stopped because my phone wasn't making any noise and I wanted to know when I hit each mile. I couldn't figure it out so I kept going. 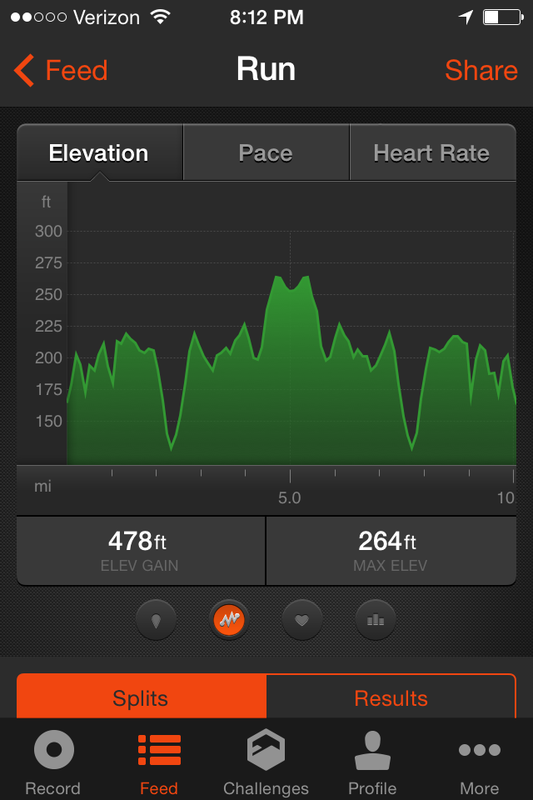 Most of the run was on a road with either no shoulder or an extremely narrow one. The motor vehicle operators were courteous. They would veer away from the side of the road and I would follow that with a hand wave. When Bryce and I started running together, a while back, he asked me why I wave to people. My response was simple, "I wave to anyone who doesn't hit me". I had an idea of the hills because I've driven the bike course a couple times, but it never matches the feeling of running. I felt like I was keeping good pace though. A while into the run I finally told myself that I was going to stop to see how far I had went. It felt like I had gone a good distance but knew that I would overshoot how far I had gone, and follow up the overshooting with some good ole fashioned depression for having a long way to go. I told myself I had only gone about 3 or 3.5 miles. What I would see next was great. 5.1 miles! Over halfway done! I would fly above the clouds for the remaining 4.9 miles! Just kidding. The way back was good but it wasn't great. I was hilled out and on the last one I stopped halfway up. The pit stop lasted a good 5 seconds and I kept going. Finishing the mileage was great though. The confidence build cannot be measured. Feels like I'm back. 1. The race went off well, I learned a lot about triathlons, showed the race director I was a worthy course captain, made some friends, and feel so excited that I can't wait to work another one!